Being able to stay in one place for four weeks, you get the chance to explore and live like a local. 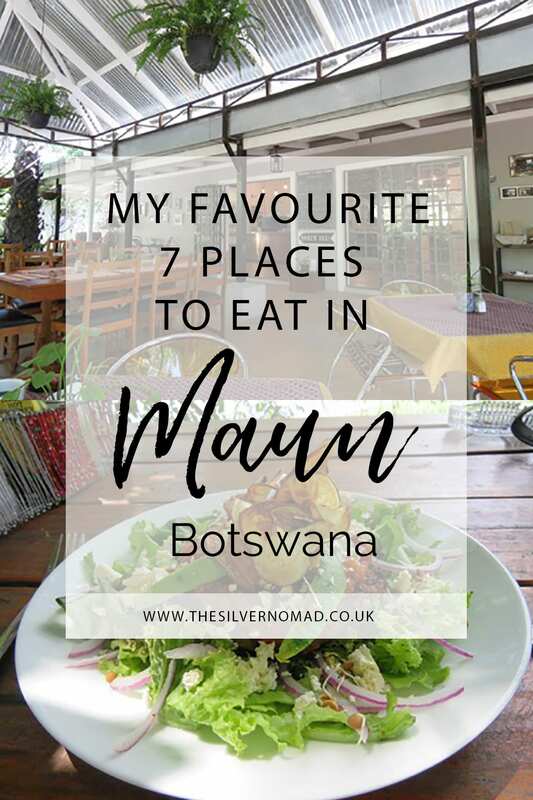 We spent a month in Botswana housesitting before setting off on our 6-day safari, so I was able to explore the variety of restaurants and eateries that Maun has to offer. 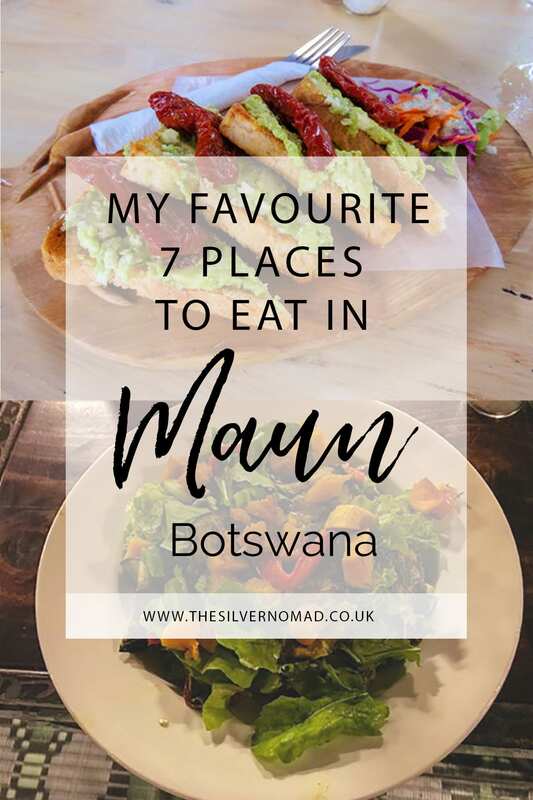 Inevitably I had a few favourite places to eat in Maun! Maun (pronounced mau–uunn) is on the south-eastern edge of the Okavango Delta and stretches along both sides of the Thamalakane River. The north side is the town and some residential and the south side more residential. 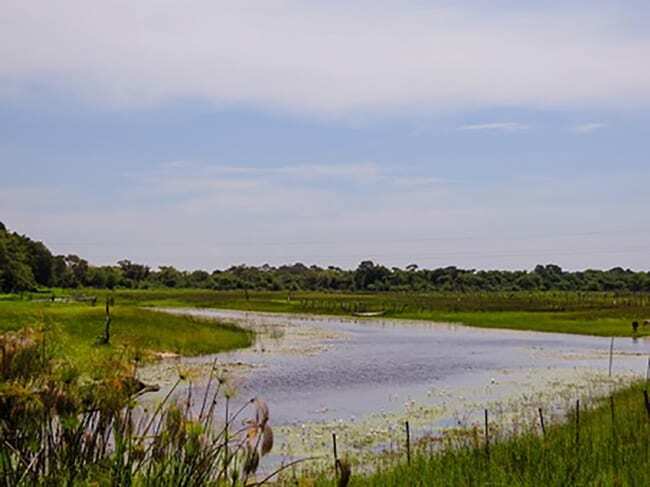 Maun is known as the gateway to the Okavango Delta and is ideally placed as a starting point for an African adventure. In fact, most international flights landing at Maun airport bring tourists on their way to safari. 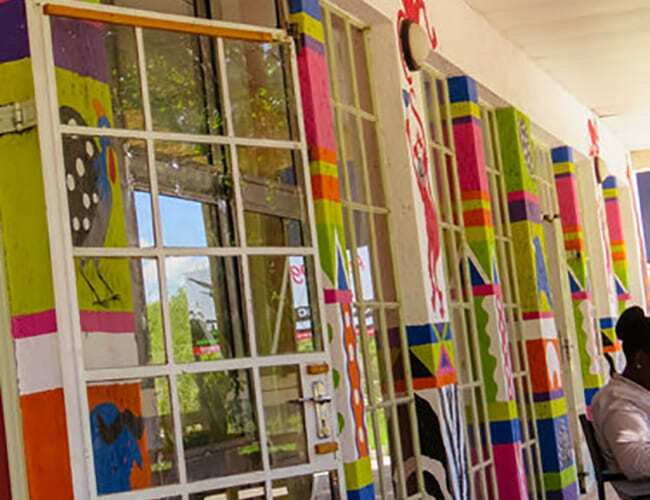 Although there are a few shopping malls, Maun is not the most sophisticated of towns, and you will find donkeys, goats and cows meandering along the roads along with the occasional warthog, baboon or giraffe. But it is honest – what you see is what you get, and therefore I have a soft spot for it. As you drive into Maun’s centre along Sir Seretse Khama Road, you can’t miss the powder-blue building on the right. 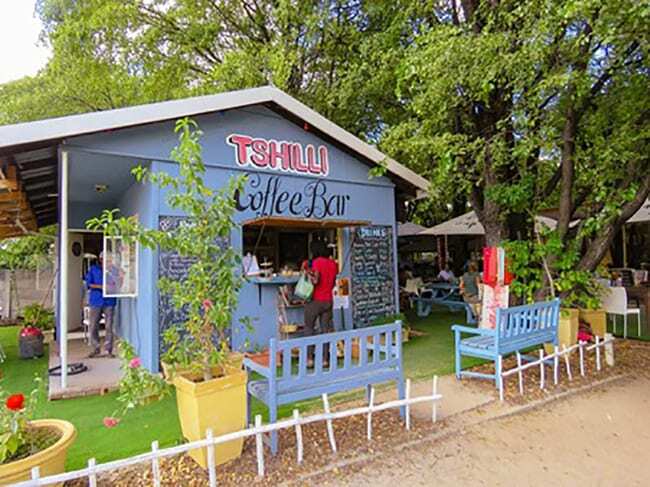 Tshilli Farmstall is quite unassuming, but so much more than just a cafe. The comfy seating to the side provides a chilled place to sip your freshly squeezed juice, smoothie, milkshake or have your fresh coffee. The menu is displayed on colourfully decorated blackboards with quotes and sayings as well as the menu. The food is freshly prepared and delicious with a range of both vegetarian and non-vegetarian dishes as well as chocolate brownies to die for. 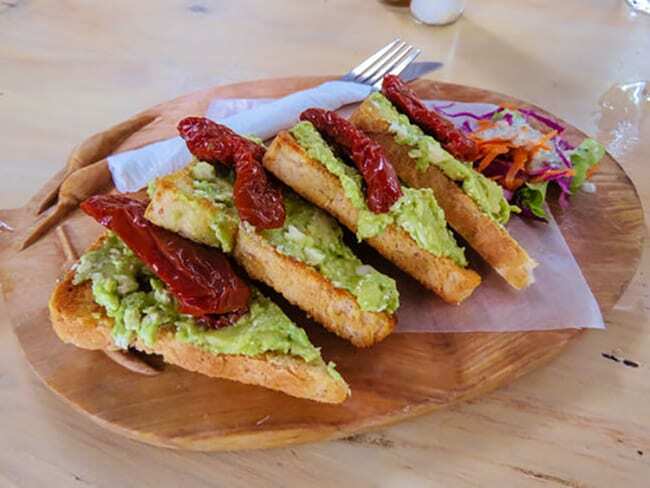 Don’t miss out on the Smashed Avocado on Sourdough with Sun-Dried Peppers and salad and Tshilli’s Hot Pepper Sauce! Tshilli Farmstall was definitely my favourite place to eat in Maun. Tshilli also arranges live music and have just opened a gift shop selling candles, skincare, natural insect repellants and a variety of gifts and toys. Check out their Facebook page. Further along Sir Seretse Khama Road, on the outskirts of the town is Marc’s Eatery. Part restaurant, part delicatessen, part takeaway, Marc and his business partner Debbie, have a passion for providing top quality food. Whether you are looking for a place to stop for a coffee and cake, lunch or dinner, Marc’s Eatery is perfect. 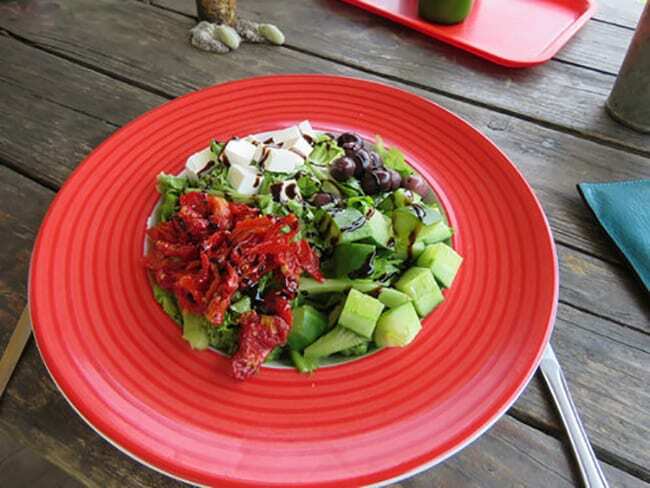 The menu has a mix of International foods and a delicious range of freshly made salads, cakes and sandwiches and daily specials. They cater to vegan, vegetarian and gluten-free diets. You can even get your packed lunch ready to pick up in 30 minutes! 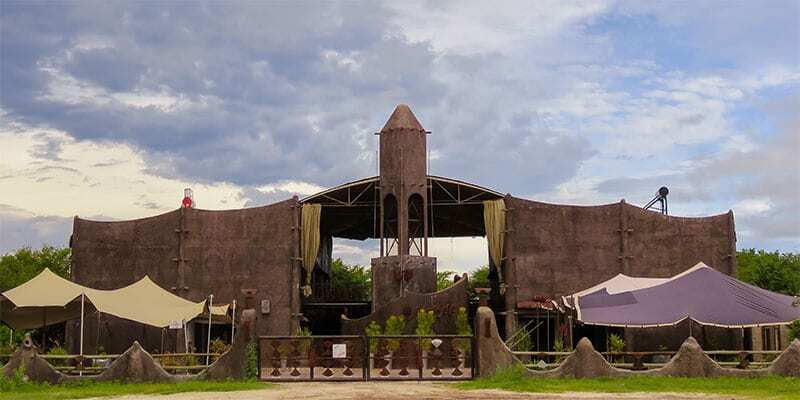 The Motsana Centre & Arts Cafe, building along the Shorobe Road, looks like it would not be out of place in a Mad Max movie, with exposed metalwork, and a distinctly futuristic feel. Underneath the metal canopy, there are workshops, dance and yoga studios, a shop or two and some offices, all centred around the coffee shop and eatery for casual dining. The whole vibe is chilled and relaxing with oversized turquoise, brown and green cushions on the chairs and soafas. 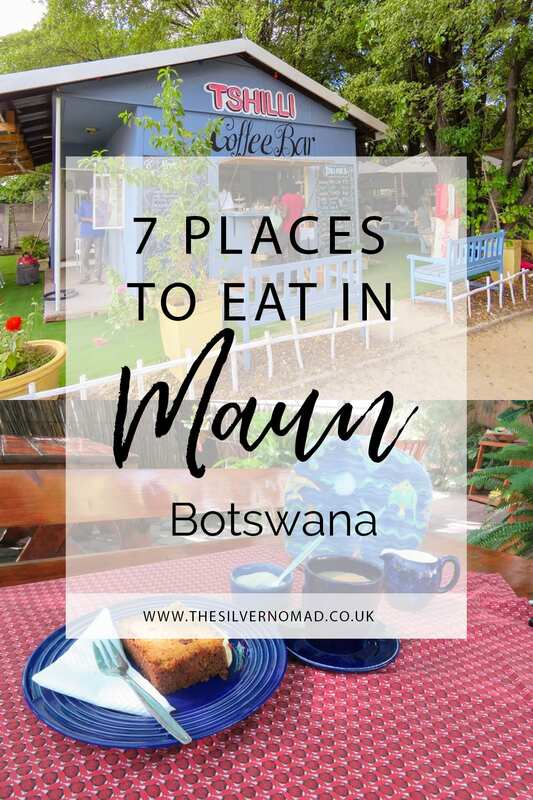 The food is an intriguing mix of local Botswanan and international dishes all freshly made. 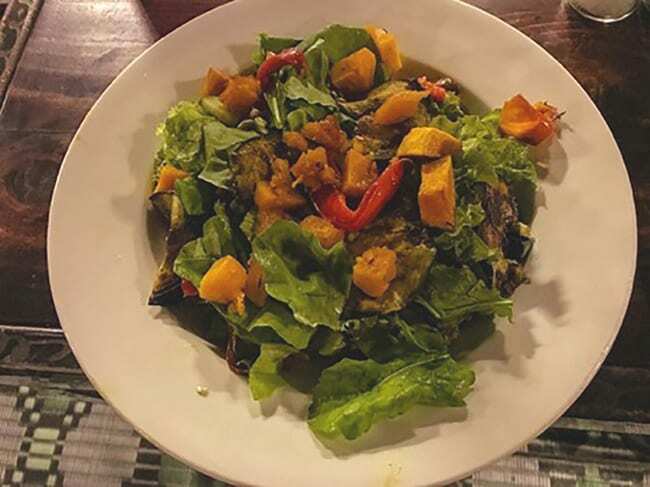 The salads are full of flavour: my favourite was a warm salad or butternut squash with peppers and tofu over leaves with a punchy dressing. Don’t miss out on the homemade cakes which are lush and delicious. 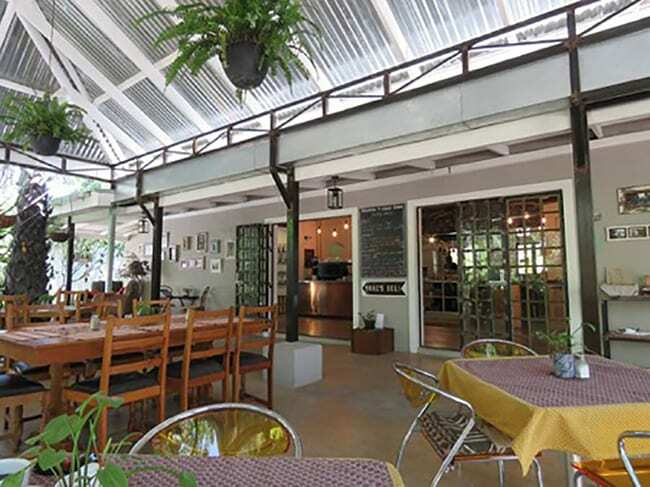 Overlooking the Thamalanke River and a hippo pool, the Old Bridge Backpackers is a relaxing place to hang out. Along a dirt track off Sir Seretse Khama Road on the right, as you drive towards the Shrobe Road, the Old Bridge Backpackers combines a camping area with the restaurant. There is plenty of seating underneath the large canopy or outside by the banks of the river. 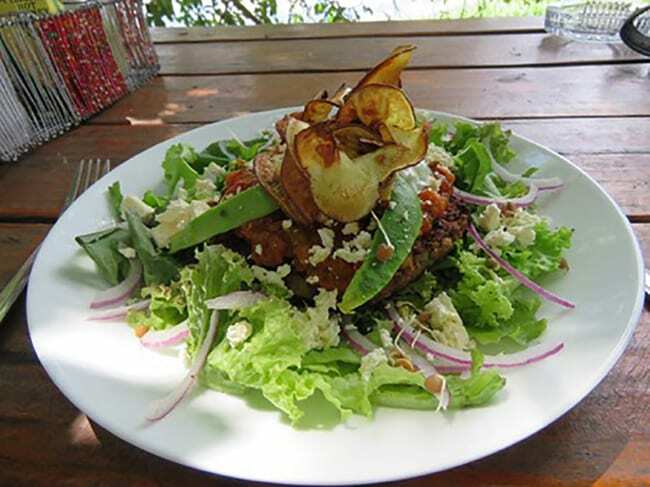 As one of the owners is vegan, there is a good selection of vegan and vegetarian food with salads and well-stacked lentil and bean burgers with abundant salad. For the meat eaters, there are steaks, ribs, burgers and even an African meat stew. If you are lucky, you will see one of the hippos in the river, but they are quite shy. 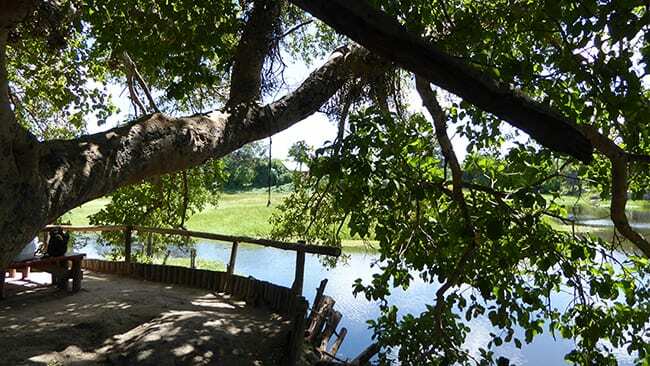 Old Bridge Backpackers is the perfect place to sip Sundowners and watch nature do its thing! 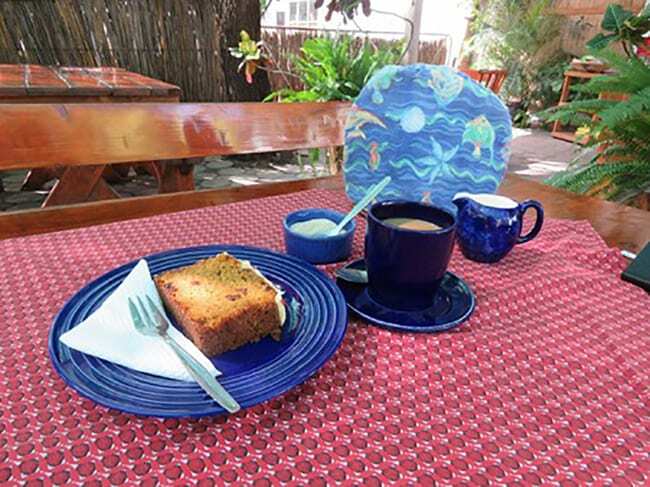 Nestled behind Mathiba I Street, Hilary’s Coffee Shop is a shaded sanctuary from the heat and bustle of central Maun. Opening at 8 am during the week and 8.30 am on Saturdays, Hilary’s is perfect for tea or coffee with homemade cake, or a light lunch of freshly made sandwiches, baked potatoes or one of the day’s specials from the board. Hilary’s caters for vegetarians, vegans and gluten-free diets. It is peaceful and I love the way the tea and coffee pots come with tea cosies!. Part cafe part shop, Wax Apple is a great little place for breakfast, brunch or lunch. With plenty of outdoor seating, the food is generous and delicious. Sit and watch the world go by while you enjoy a freshly ground cup of coffee, milkshake, tea or soft drink while eating a bran muffin or a light lunch of baked potatoes, toasted sandwiches or homemade burgers. There is ample parking and free wi-fi. The Okavango River Lodge is about 10km outside of Maun on the left-hand side of the road as you drive towards Shrobe. Sitting on the banks of the Thamalanke River, the restaurant is a peaceful haven to sit and watch for birds and wildlife. There is seating in the shaded indoor area or the outdoor area with benches and tables to enjoy the view. The food was quite basic and pub grub with salads and stews, but generous portions and tasty.